The 2.0-liter FB20 engine replaced the EJ-series 2.0-liter engine. The FB20 is the entirely new flat-four third generation engine. Subaru announced the FB-series engine in 2010. The engine looks pretty similar to its predecessor at first glance, but it has a lot of changes inside. This engine has the new cylinder aluminum block with decreased piston bore. The same displacement is achieved by increasing piston stroke (this change gave a little more torque at low revs also). There are asymmetrical connecting rods to keep exterior dimensions of the engine are unchanged compared to EJ-series engine. New cylinder heads are DOHC 4-valve per cylinder heads. The angle between intake and exhaust valves was reduced to 27° (EJ angle was 41°). The distance between camshafts are smaller - 104 mm instead 126 mm. That was made possible by moving to chain-driven camshafts (EJ used timing belt). The narrow valve angle and smaller bore provide less unburned fuel during cold start, thereby reducing emissions. 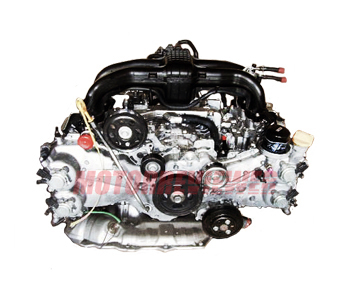 Both camshafts, intake, and exhaust, are with variable valve timing system (Subaru AVCS). The intake manifold is made of plastic material. It has four tumble-generation valves, which manipulating the intake flow to maximize efficiency through electronic control. Subaru said that they achieved 28% reduction in friction losses by applying lightweight pistons and connecting rods. The CO2 emissions were reduced by 4%. Fuel consumption reduction is 10%. As a result, the engine is more environment-friendly with the same power, and a broader band of torque compared to the EJ20. The engine consumes oil. It is necessary using only Subaru recommended engine oil and always checking oil level.